If you have been summoned to criminal court in Douglas, Wyoming (a part of Converse County), you need a criminal defense lawyer who knows how things work in the local court. Our legal team is ready to work for you in Douglas's district, circuit, and municipal courts. Douglas, Wyoming is a town with a rich historical culture and many long-term residents. Sometimes, residents and visitors alike can find themselves facing DUI / DWUI charges and other criminal charges as they explore the city's many sites. When criminal charges happen, you need a lawyer familiar with the local courts and their staff. The 8th Judicial District Court is located in the Converse County Courthouse at 107 North 5th Street, Suite 228, Douglas, WY 82633. The court is presided over by the Honorable John C. Brooks (through January 2021) and the Honorable Keith G. Kautz. From the District Court bench, the judges preside over felony criminal cases. The Converse County Circuit Court shares the Converse County Courthouse with the 8th Judicial District Court. The Honorable I. Vincent Case, Jr. and the Honorable Randal R. Arp hear misdemeanor criminal cases along with assault and battery, family violence, stalking, DUI and DWUI, as well as traffic tickets, such as driving under suspension. It also handles the preliminary stages of felony cases (before they get referred to the District Court). The Douglas Municipal Court is held on Tuesday mornings at 9 a.m. in the Council Chambers in the lower level of City Hall. The address is 101 North 4th Street, Douglas, WY 82633. The Honorable H. Rick Hollan hears cases involving city ordinance violations, (with penalties of up to 6 months in jail and/or $750.00). 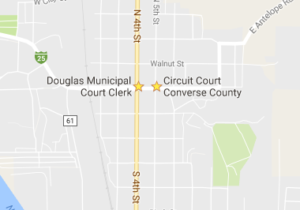 If you have a case in Douglas, Wyoming, you may also need to know that the Converse County Clerk is located in the Converse County Courthouse, 107 North 5th Street, Suite 114, Douglas, Wyoming, 82633. Criminal defense lawyer Christina L. Williams is familiar with the Converse County courts and appears there frequently. She knows how to work with the court staff and with Converse County Attorney Quentin Richardson's office. Our team at Just Criminal Law is ready to build your case in a way the local judges and juries will understand and receive. Our skilled criminal defense team is there for you in Douglas, Wyoming. Whether your case is before the district, circuit, or municipal court, we can help develop your case and protect your rights. Call 307-686-6556 or contact us online to schedule your personalized case review and strategy session.